IU held the official dedication ceremony for a new, state-of-the-art, 3,000-seat facility - Wilkinson Hall. Wilkinson Hall is a multi-use training and performance center that is the new home venue for the Indiana Volleyball and Wrestling programs. Consistent with the university's master plan, the facility brings these two programs' home competitions back onto the IU Athletics campus from their former University Gymnasium home at the intersection of 10th Street and the 45/46 bypass. 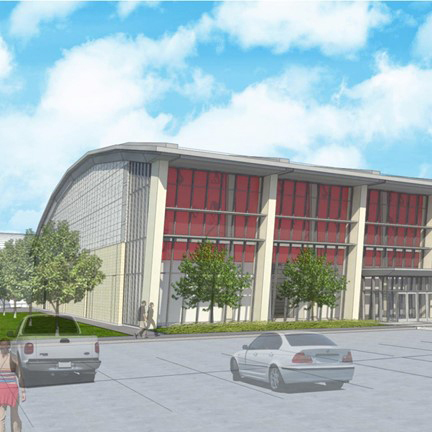 In addition, Wilkinson Hall will provide the entire Indiana University Athletic Department and its programs with a new top-flight facility for year-round training, and will serve as a venue to host department and university events. Wilkinson Hall is named after IU alumnus Jay Wilkinson and his family, in recognition of their $10 million major gift to the "For All: The Indiana University Bicentennial Campaign." This is the latest and largest gift from the Wilkinson family, who have an incredible history of support for IU Athletics and its student-athletes. In addition to their $10 million gift toward the construction of Wilkinson Hall, the Wilkinson family has also supported IU Athletics in countless other ways. In 2012, the family donated $1 million toward the North End Zone's strength and conditioning facility, which was renamed the W. Jay and Nancy Wilkinson Performance Center. In 2016, the family endowed the Nancy Wilkinson Athletic Scholarship in honor of Jay's late wife. Jay, meanwhile, currently serves on the Varsity Club's National Board of Directors. Jay and his wife Melissa, also an IU alumna, were joined by their four children, family, and close friends for the dedication.